Autumn’s arrival should not mean the end of enjoyable nights away, either by yourself or with friends. Bivvy bags are certainly not much fun when it is pouring with rain. So today I’mm going to encourage you to expand your microadventure kit list a little bit with the inclusion of a “basha”. A “basha” is army slang for a simple shelter made from a tarpaulin. Rig this up over your bivvy bag and you’ll get a good sleep even in snow or heavy rain. It’s well worth the cost of just a few quid, the weight of a couple of hundred grams and the hassle of 1 minute’s assembly. 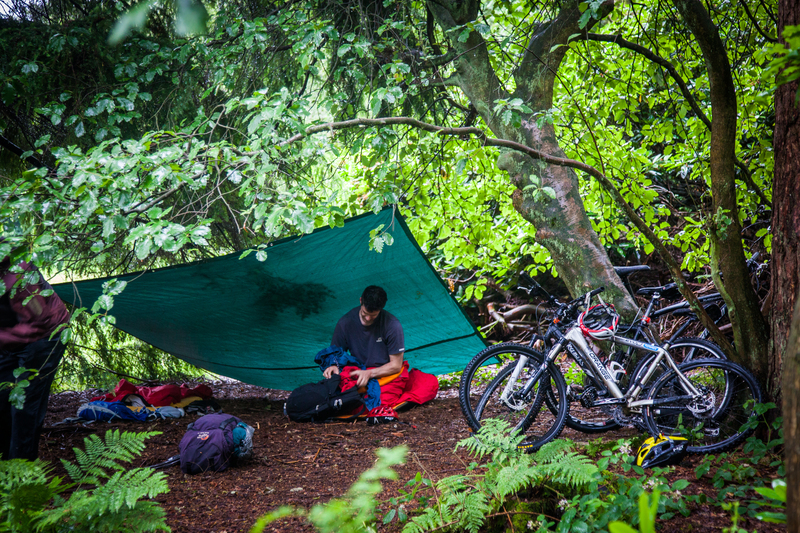 (If, however, you are eager to spend money, then the Trailstar is great too, also anything by Alpkit). I don’t want my blog to turn into af Ray Mears / Bear Grylls survival against the apocalypse thing. So I’mll settle for showing you a photo, adding a couple of shopping links and leaving the rest to you to figure out. If you google “basha” you’ll see all sorts of fancy bashas. You can learn what to do from them. If you have hiking poles (or a removable bike wheel), then you can rig something even when there are no trees around, like this. Tarpaulin with eyelets. Get from a pound shop, B&Q or online. The size is up to you, but 8 foot x 10 foot is pretty luxurious. I have a 2 foot x 4 foot one for when I’mm being a bit daftly lightweight. Bungees. You’ll need at least 2, but up to 6 would increase the pitching options. Tent pegs. You’ll need at least 2, but up to 6 would increase the pitching options. Or use twigs. String. Optional to increase pitching options. Hiking poles / bike wheels. Optional to increase pitching options. Bashas are a great, lightwieght way to sleep out in wet weather.. very versatile and easy to pack down. It does attract some funny looks when you set up on a camp site with one though..
I’ve bought a poncho tarp for this reason – dual purpose of course, though I’ve yet to find a video or other account of how to make it into a shelter when already wearing as a poncho (it’s raining) and not getting wet! Any suggestions? I love using a basha. It was always my ‘tent’ of choice for Glastonbury! Using an army poncho like the one pictured is so easy and really effective, and they’re tough as old boots. I’m still using the one I was issued in army cadets 25 years ago! Disappointed to see you describe bushcrafters as ‘weirdos’. While I’m not a bushcrafter myself I’ve only ever found them to be an incredibly helpful and often very knowledgeable community. They have long been at the forefront of wild camping and appreciating the countryside, I’ve learnt a lot from them. You’re right – that was the wrong choice of word. I’ve amended the text too. Hi guys. What is a good size tarp for me to use as a basha? I’m 1.85m (6ft) tall. Ive done some reading and it seems like a 8 x 10ft tarp is a good size? Then tried a 1 quid foil prism shaped one from poundland. Awesome!!! Any suggestions for a couple of poles to give the tarp more pitching options? sorry – I’m not really an expert on gear like this. Try screw tipped/footed storm poles that are meant for fishing umbrellas/winter skin bivvies. If the forecast is good we just bivvy but if there is any chance of rain we always build a den/basha/tarp. My adventure bud Tracy bought some thick black damproof layers from a DIY shop.. They provide a brilliant protection in all winds and weathers. We secure them by tying to a tree, trunk branch or rock, make a hole in the corners to atach the string and, to give some height we use our walking sticks .If its a rainy windy night we use the poundland green sheets with eyelets for the sides too. Big thanks always for all your help Alastair! Love #microadventures and thats all down to the wonderfully amazing you! Hmmm….I’ve never really understood bivvys. If it’s not inclement weather, then you don’t really need the bivvy. If it’s raining, a well pitched basha negates the need for a bivvy. Help me understand how the bivvy is a valuable addition to the kit if one’s already packing a basha. But it does mean that you need to pack a basha on fewer occasions. I use a British army Gortex bivvy which was brand new for Â£40 and an army Basha for the same money. Both excellent bits of kit and very robust. Admitedly they are in MTP as they get used for my army cadet force involvement, but mean that you are less conspicuous when wild camping in sensitive areas. The point of the Basha as well as the bivvy is that the great British weather is so unpredictable. A Basha unless set up as an enclosed tent, which you can do, is usually still open. So wind and rain will still get at you.